I have been thinking long and hard about what to do about my unit. How will I find more space and keep it tidy easier? I started with de-cluttering and that has been great. 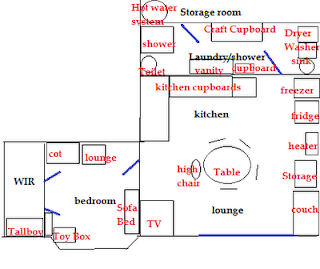 I have tried re-arranging the furniture a bit but it doesn’t seem to work too well no matter how I put it. I also need to get a bed for myself, as the sofa bed is no good for my back. 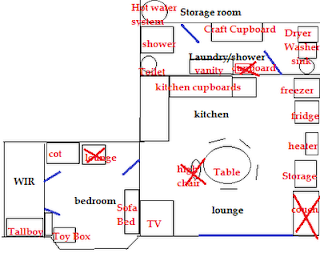 I thought I would share with you the current lay out of my house and my plans and you can tell me what you think. 1.) Get rid of the lounge. I only have 2/3 of it anyway. Part of it broke and I threw it out, so I just want to get rid of the rest. 2.) Get rid of the high chair. We don’t use it anymore, DD sits at the table now. 3.) Get rid of the cupboard next to the vanity. I emptied it the other day, it’s actually a bedside table that’s the landlords and they are happy to take it out if I want. 4.) 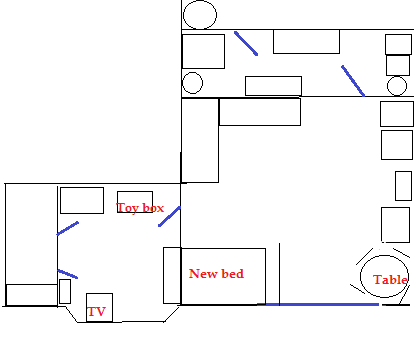 Since I need a bed, I was thinking of getting one and putting it in the corner the TV currently is and moving the TV to the bedroom. I would also put a screen in front of the bed to give a little privacy. 6.) 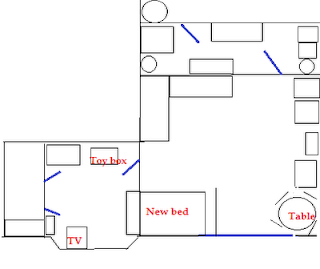 Move the table more towards the corner where the couch currently is instead of in the middle of the room. Now the reason I feel this would work better is because one of my pet hates is havign the sofa bed pulled out. Another one is the table in the middle of the room. We don't really watch TV and I am pretty tempted to just get rid of it, but there are DVD's my girls like to watch which give me some peace time, so I want to keep it as well. Any thoughts on my plans? Also, it should only be for a few months, as my husband and I are working on things, and it's going well, so it will all change again, hopefully to a HOUSE instead of this unit. Oh, and incase you're wondering, one daughter usually sleeps in the cot, the other with me. That's why only 1 bed for them. Thansk for your in put! we have a screen for you if you want... C hates it but I like it... and it's FREE!